Evening jazz played quietly in the Ismon House just past Charlie’s Tavern on Monday, Sept. 19. English and French conversations intermingled over fruit, cheese pastries and lemonade. Warm hugs were a common sight and friendly chuckles echoed throughout the reception. Albion’s 20th anniversary celebration of its sister city ties to two French communes, Noisy-le-Roi and Bailly, was coming to a close. 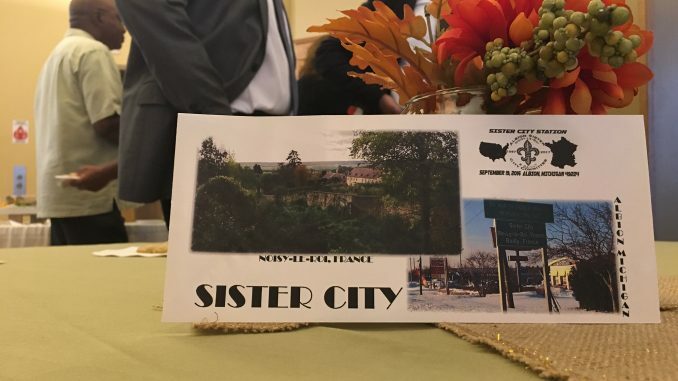 A sister city is an agreement between two regional bodies that promotes cultural and commercial ties, oftentimes overseas. Noisy and Bailly are jointly tied to Albion. Albion residents, college faculty, city officials, sister city committee members and youth mayors attended to celebrate and honor the relationship with their international guests. An eight-member delegation – made up of the two cities’ mayors, their adjuncts and their sister city committee – flew from their homes just outside of Versailles to Chicago and took the train to Albion on Thursday, Sept. 15. A committee member from Godella, Spain (another sister city of Noisy), also attended. Activities for the delegates throughout the weekend included a guided tour of the Detroit Institute of Arts by Jill Shaw, wife of Anthropology Professor Brad Chase; a walk in the Festival of the Forks’ parade; craft beer tasting; a city-wide reunion barbecue in Victory Park and talks with college students taking French classes. Events concluded at Ismon with where speeches were given, gifts were exchanged and history was made. The history of Albion’s sister city relationship began in the late 1990s. Sue Marcos, then president of the Albion Chamber of Commerce, lived in the Noisy area. She and her French friend Alain Frene began speaking of an exchange of culture and economy between the two regions they represented. Soon after, an official sister city agreement was signed during the 1997 Festival of the Forks. Committees from both cities were formed the following year to oversee the relationship. In 2010, at the Noisy delegation’s encouragement, Bailly became a joint sister city to Albion. Since the relationship began two decades ago, over 600 Albion residents, from 9-year-olds to senior citizens, have flown to France to learn more about its culture. Noisy-Bailly citizens have flown to Albion as well, where they are often hosted by residents throughout the neighborhoods. Since 1998, Albion sister city committee member and French professor Dianne Guenin-Lelle has witnessed how the tri-city relationship has “blossomed” far past formal affairs and procedures. “We get out of this relationship some of the same things, which include lifelong friendships, deep relationships [and] learning so much about the world through our friends,” said Guenin-Lelle.. The college has been active in the relationship as well. The Student Entrepreneurial Exchange takes students to the Ecole Superieure de Vente in nearby Saint-Germain-en-Laye to work on the development of international business plans and cultural exchanges. Education students have the opportunity to travel for a week during winter break to observe classes. French youth have come to the college to perform at its fall piano competition. The list goes on. Albion College’s relationship to Noisy-Bailly earned them the Senator Paul Simon Spotlight Award in 2014, which recognizes strong international college initiatives. At most, three are given each year. Sister city committee member and Visiting Assistant Professor of the Education Department Stacey Levin is looking forward to continued opportunities ahead, particularly for Albion’s youth. Along with sending Albion’s youth over to France to learn about the country’s culture, French language classes are being provided for free through the Kids at Hope Youth Development Center. The reception at the Ismon House was a time for final friendly chats before the delegation’s departure. It was also, however, a time for history. Starting off the evening was Jackson postmaster and Albion resident Diane Bell who announced that Albion would be getting its own cancellation stamp of its sister city relationship, a feat that took “almost an act of Congress” to achieve. Until Oct. 26, commemorative envelopes with Albion’s cancellation stamp can be purchased at the Albion post office with $3 cash or credit. It will also be featured on the postal news network and stamps.com. Members of the delegation were given commemorative envelopes with Albion’s cancellation stamps on them. Other gifts to the international visitors included plaques marking the anniversary of the sister city relationship. Delegates of Noisy-Bailly presented Albion with a large poster from a museum exhibit on the relationships between the U.S. and France. Rosa Estelles of Godella gave Albion a local newspaper marking the sister city relations, a drawing, information on her city and a magnet. After a weekend of celebrating friendships, Noisy-Bailly sister city committee member Annick Theis-Viemont presented the reception’s final gifts. To Albion sister city committee members Mary Slater, Mae Ola Dunklin and Dianne Guenin-Lelle, she gave three handmade plates. Written on each was France’s motto — Liberté, égalité, fraternité. Liberty, equality, fraternity. Beau – congratulations on a very well written article on the Sister City! And, much appreciation to the members of the Albion Sister City Committee for providing the French delegation with a very warm reception…and a special stop by Amtrak!